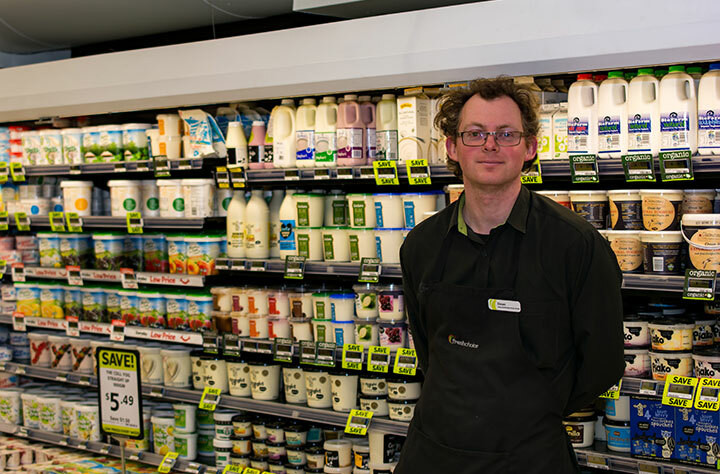 Dean Wastney – Chilled Foods Manager. Did we mention that one half of the Fresh Choice Nelson owner/operator team, Mark A’ Court was a DJ in a former life? As such, he’s a dab hand with the mixing decks… We’ve been told our in store tunes are pretty cool, but our chilled and frozen department is the bomb! Our freezers, will quite literally, light up your life via motion-sensors, so dance like nobody’s watching and ogle the ice cream! Our 200km radius initiative extends to all departments and within chilled and frozen you’ll find local dairy produce, together with frozen ice cream and veggies from Talley’s. The range of Artisan dairy companies offering charming cheeses is ever expanding, and we stock a range that will impress even the most serious cheese aficionado. If you’re lactose intolerant, you’ll find goat’s milk, coconut milk, coconut yoghurt, coconut ice cream and locally produced hazel nut milk.